Startup automaker Faraday Future hired the best, as it often did, when it needed an audit of its finances to help secure vital fundraising and government loans. But what auditor KPMG—one of the world’s biggest and most well-regarded auditing firms—walked into when it agreed to look at Faraday’s books was a company with no coherent corporate structure, financial statements in complete disarray, and a $60,000 per month lunch bill, according to internal emails seen by Jalopnik. Documents seen by Jalopnik reveal Faraday’s initial run-in with the auditor eventually went sour, with KPMG resigning from the job in November 2016 over an array of issues stemming from the startup’s organizational structure. FF needed a full financial audit as it was something the company would be asked for every time it went looking for money. That’s particularly relevant, as Faraday’s recently-minted chief financial officer, Stefan Krause, is currently shopping around for new investors to raise a billion dollars. But when KPMG dug in, the firm came to the conclusion there were too many problems with FF, Jalopnik has learned, so it resigned from the job the Wednesday before Thanksgiving before completing an audit of the startup’s fiscal years 2014 and 2015. KPMG declined to elaborate on what transpired, citing “client confidentiality obligations.” Faraday is adamant that it is now on solid footing, with a two-year plan that includes completing construction of the still-stalled factory in Nevada. FF says it has since received a completed audit from a different (yet second-tier) firm for the years KPMG was hired to review. But the episode highlights the financial difficulties that have plagued the company from the outset—an issue that’s noteworthy ever since Faraday’s main financier, the Chinese tech-conglomerate LeEco, announced last month that it was slashing its U.S. workforce and dramatically scaling back its operations in the nation. And LeEco’s founder, the billionaire Jia Yueting, has reportedly signaled that he won’t be investing any more into Faraday, prompting the recent rush by Krause for fresh funds. It’s not rare for an auditor to decide to abandon a client before the job is finished. But experts who spoke with Jalopnik said KPMG’s decision is a signal that Faraday’s books were in such poor shape that it triggered the move to resign. “Typically, [start ups] want to have aggressive accounting because they want to kind of window dress their financial statements to attract investors,” said Devin Williams, assistant professor of accounting at the University of Illinois. That’s why a fledgling, ambitious startup like Faraday would turn to a firm like KPMG. But auditors only have their reputation to stake themselves on, said Williams. Williams said one aspect of Faraday’s situation with KPMG stands out. “One thing that is slightly not typical is—and you would never get anyone to admit to this—often, audit firms will do the professional courtesy of letting their clients actually dismiss them rather than the firm initiate the separation,” he said. Internal documents seen by Jalopnik indicate that KPMG was retained in the summer of 2016, just ahead of Faraday’s push to develop a version of its flagship car—the FF 91—to show off that the tech-forward CES conference in Las Vegas. The question of whether Faraday had the financial resources to bring the FF 91 to production loomed from the moment it first came on the scene in late 2015. But as months passed, a picture of a startup in complete disarray—not just one facing the typical pressures of a new venture—emerged. In October, construction firm AECOM said it was $21 million behind on payments. At the same time, a half-dozen executives jumped ship, primarily due to concerns about a controversial land deal involving Faraday’s main financier, LeEco. The following month, FF was hit with multiple lawsuits for allegedly failing to pay a contractor that arranged a deal for it to purchase the domain ff.com, missed payments to a key supplier, and for falling behind on rent payments. On top of that, a key official in the state of Nevada—where Faraday originally had plans to build a $1 billion factory whose footprint has since been reduced—started openly questioning whether the company was legit. 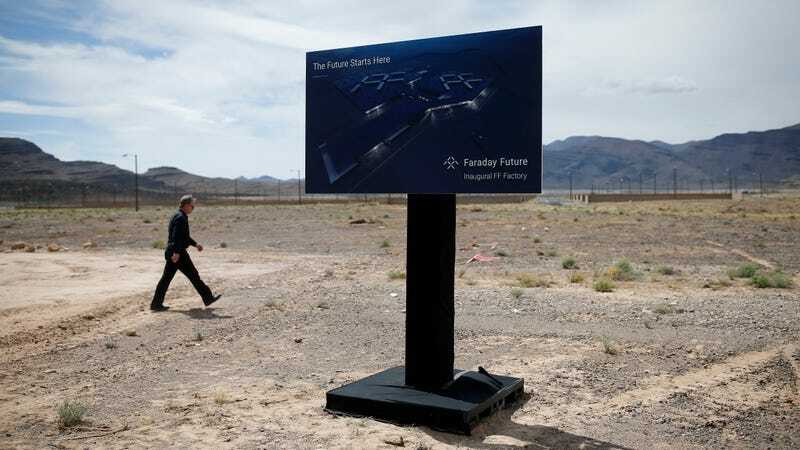 When Faraday halted work on construction of the factory, allegedly to focus on the CES car, Nevada’s treasurer Dan Schwarz took direct aim at what he viewed as a bogus enterprise. By then, KPMG had had enough. In a lengthy message to Faraday’s top executives, Jalopnik learned, the startup’s director of corporate finance, Steve Howard, explained the auditor’s decision to end its relationship with Faraday stemmed from the departure of executives, Faraday’s “apparent lack of liquidity,” and Schwarz’s “incriminating” statements. But these were only the reasons explicitly stated by KPMG. Howard went on to say that there other unmentioned, more worrying problems that plainly drove KPMG out: a lack of proper internal controls; a lack of transparency from Faraday decision-makers; insufficient bank account procedures for the various LeEco enterprises, resulting in funds being co-mingled; unclear records to document and assign debt to incoming funds; and the fact that it took six months to review the finances of a company barely two years old without resolution. Serious investors can’t trust a company to provide their own financial records alone, as the company could easily falsify their own records. An independent audit “is the first step” for securing serious investment, one source said. Furthermore, Faraday anticipated becoming a public company down the road, possibly with an IPO as early as 2018. For that, the company knew it would need three years of audited financial statements, and picked KPMG “to establish a long-term relationship” with, the first source explained. What’s interesting is that Faraday says audits have been completed for 2014 and 2015, despite the fact that KPMG—considered one of the Big Four auditors in the world—spent a worryingly and extraordinarily long six months reviewing the startup’s books before throwing in the towel, according to internal emails seen by Jalopnik. That seemed unusual for KPMG, given Faraday’s size and only two years of operations. “The best accounting minds work for these firms,” Williams, the professor, said. Sources say the Faraday Future later hired the second-tier firm BDO after KPMG left, though FF hasn’t explicitly say that’s who completed the recent audits. CFO Krause told Business Insider that a “significant” automaker has expressed interest in possibly acquiring a stake in the company, but didn’t offer any further comment. It should be noted that while large investors and government offices are notorious for closely pouring over a company’s financials, carmakers are significantly more lax with their money, as another source familiar with the situation pointed out. Somewhat incredibly, despite not having a facility built stateside yet, Faraday’s plan also includes supporting a new factory in China and the development of another electric vehicle for LeEco, whose CEO Jia Yueting has invested hundreds of millions into FF. Recall that Faraday and LeEco have a strange relationship of sorts, and last year Faraday employees reportedly were taken off their project to help design a LeEco prototype. Faraday spokesman Otto, more importantly, notes the $1 billion Faraday hopes to raise would be used to complete the development of its flagship car. That is to say that development of the FF 91 remains incomplete. With the first two years of the company’s books now cleared, Faraday says it’s full steam ahead for bringing its dream of a super-connected autonomous vehicle to life. That’s exactly what it said when we last had a big check-in with the company, a few days before the LA Auto Show, midway through November 2016. Have any insight into what automaker has expressed interested in Faraday? Know of anything else interesting about the company? Drop a line to tips@jalopnik.com. Additional reporting by Raphael Orlove and Andrew Collins.